Malahat editor John Barton interviews Summer 2012 contributors Dan O’Brien and Paul Watson about their unique collaboration, as poet/dramatist and photographer/journalist, to document and explore the impact of imperialism, colonization, and war upon marginalized peoples in Afghanistan, Somalia, and the occupied lands of North America. Dan O’Brien’s award-winning plays have been produced across the United States, including Actors’ Theatre (Louisville), Geva Theatre (Rochester, N.Y.), and Second Stage Theatre (New York). His poetry and fiction have been published in Greensboro Review, Nimrod, and Quarterly West, among others. He lives in Santa Monica, California. Paul Watson, a reporter for The Toronto Star, covers Afghanistan and Arctic and Aboriginal issues. He won the 1994 Pulitzer Prize for Spot News Photography and the 2007 Drummer General’s Award for Where War Lives. He is based in Coquitlam in B.C.’s lower mainland. 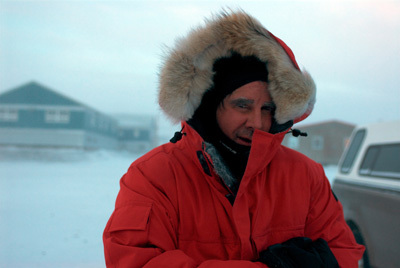 Paul Watson, as photographed by Dan O'Brien during a visit to Ulukhaktok, Northwest Territories, on Victoria Island in the Arctic Archipelago, in February 2010, where O'Brien was researching his play about Watson, The Body of An American. How did the two of you come to collaborate, if “collaborate” is the best word to describe your work together? DO: I first heard Paul’s story, and his voice, on National Public Radio’s Fresh Air in 2007. I’m nota writer prone to reaching out to strangers for collaboration, but I was deeply moved, unsettled, by his story of being haunted by the U.S. soldier he photographed desecrated in the streets of Mogadishu in 1993. I felt a strong if ambiguous kinship between Paul’s graphic, undeniable haunting, and the more private if not prosaic hauntings in my life. Of course, if Paul hadn’t been willing to share his story with a stranger like me, that first email to him would’ve been the last. Collaboration is a fair term for what I’ve been attempting with these poems, though perhaps “adaptation” is more accurate. For the most part I shape and embellish, personalize and distill his work into my own voice, or really into my character of “Paul Watson.” Some of the poems are created whole cloth from experiences I’ve had with Paul, and from recollections of things he’s said to me. My background as a playwright is probably important here—in many ways I’m acting, imagining I’m Paul and creating a voice that’s neither one of us entirely. PW: I trust Dan's memory on this. Dan, what is it about Paul’s photographs that compelled you to write The Body of an American, a play, and The War Reporter, a book of poems, inspired by them? DO: At first I was simply moved, shocked, repelled, and compelled—they’re horrible and beautiful photographs. Above all they’re truthful. There’s something uncanny about Paul. He reminds me of myself, and other writers I know, in our solitude, our passion, and our doubts. I think of Paul primarily as an artist. And yet in many ways he’s so fundamentally different from your average writer, in his physical courage and sometimes recklessness in pursuit of the truth. Perhaps naively, I still think of artists as truth-tellers, and the only truths worth telling are the difficult truths, the taboos, and the often awful realities. And Paul’s work does just this. Paul, has Dan’s “use” of your work as a source of inspiration altered how you view it yourself? PW: It hasn't, but I'm thrilled when I read what he's done with our conversations, or people I've written about, because he reveals truths that might otherwise be lost on readers. When I'm the subject, I love to see my foibles exposed with such clarity. It's a reality that I treasure in a world where the steadily increasing peripheral noise is drowning out the sort of authenticity that Dan captures. Read Dan O’Brien’s poem, “The War Reporter Paul Watson and the Lady Pol,” which appears The Malahat Review’s Summer 2012 issue. Dan, can you tell us about the play and about the book of poems? What are they concerned with? I understand the play will soon be performed in Portland, Oregon. Can you tell us a little about the upcoming production? Is the book of poems due out any time soon? DO: The play, The Body of an American, was written first, a few years ago, after Paul and I had spent maybe two years corresponding over email. It’s a two-hander, two actors who largely play characters named “Paul Watson” and “Dan O’Brien,” but they often portray other characters in the story. I like to call it a deconstructed one-man show for two actors. Some of this is sheer theatricality and storytelling, but I’m also hoping to suggest some of the elements of Post-Traumatic Stress Disorder with what’s shocking and strange in the play’s style. The basic story—of the play, but also of the poetry collection—is Paul’s haunting and the question of whether or not one can free oneself of a haunting. The play’s set to premiere in October at Portland Center Stage, directed by Bill Rauch, and it’s also won the 2011 Weissberger Award and will be published by Samuel French in the coming year. I’ve adapted parts of the play, and to some degree the poems, into an opera that will premiere at Stanford University’s Bing Concert Hall, with composer Jonathan Berger and director Rinde Eckert, in April 2013. The poems have been taking shape in the last year or two, and are starting to find homes in journals and magazines. For each of you, your work appears to be highly political and is documentary and expository rather than personal or lyric, though of course without loss of poignancy. Paul, do you perceive yourself to be a “witness”—or to be “witnessing”—with your work being a transcript of what you have seen in in Afghanistan and Canada’s Arctic and Aboriginal reserves? Dan, do you see yourself as a witness as well? DO: Absolutely. If there’s an overarching theme in the play and poems, it’s to do the work of witnessing each other’s stories. And I should say that this documentary style is a major departure for my work, and I credit Paul largely with this change. PW: I deeply hope I'm doing more than writing a transcript of what I see. What I try very hard to do, which requires tremendous personal risk in places like Afghanistan, is to be the medium through which ordinary people can speak to the outside world. The impressions created in the traditional media of foreign countries, especially their conflicts, rarely match what I feel in those places. I'm often guilty of the same failings in my reporting. I think it's a fatal flaw of the form, one that poetry is able to correct. As best I can, within the constraints of journalism, I hope to let readers sit as witnesses themselves, and judge for themselves the central issues raised in stories that I write. All I know is that prejudices and hatreds are very hard to sustain when you're sitting face to face, listening carefully to understand a person who would normally want you dead, or at the very least entered the conversation intending to spit on you or deliver a solid sucker punch. I have the luxury of being able to go to see such people. I try to bring readers along with me. 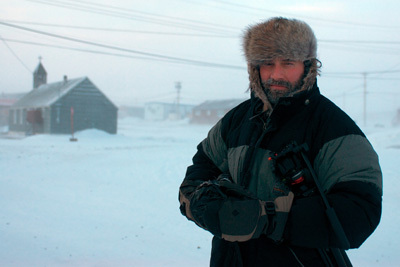 Dan O'Brien photographed by Paul Watson during a visit to Ulukhaktok in February 2010. As witnesses, do either of you feel implicated or are you simply participant observers? DO: I think it’s impossible to not feel more responsible for the events you’re witnessing, which can often feel overwhelming, if not depressing. But that’s the challenge for me when approaching Paul’s stories—how to find the beauty and hope in it, as well as the rage and sorrow, just as Paul does. Of course, I’m greatly insulated from these stories, acting as a kind of interpreter between Paul’s life and the lives of people who read poetry or see plays. PW: I'm a participant by being wherever I am in the same sense, I think, that anthropologists know their presence has some impact on the people and events they are studying. So I don't claim to be able to hide behind journalistic objectivity. But I do strive to stay as uninvolved as possible. For instance, that means avoiding the sort of crusading moral judgments that permit other journalists to write about evil in certain places or regimes. The more I learn and experience, the more elusive truth is, so I'm reduced to gathering details, whether they are facts, contradictions, or descriptive elements that make a place or person more vivid in a reader's mind. Because one of you is a Canadian and the other an American, do you find that you each bring a different perspective to the issues that your respective work explores? Or do you find that your points of view mostly overlap? If there are differences, however large or subtle, have they caused your perspectives to evolve or shift? Or is the difference in your nationalities a red herring when compared to the differences between the two of you and your subjects, the Afghans and the Inuit? DO: I suspect our politics largely overlap, though Paul is more well-informed and passionate about most issues. I’m most passionate about trying to feel and convey as much empathy as I can for the individuals involved in these stories, Paul included. Paul’s being Canadian has been very interesting to me—his angle on U.S. policy and history often comes from a subtly different, but no less provocative, perspective than mine. But I think you’re right, when it comes to the experience of Afghans or Iraqis, Paul and I—and Canadians and Americans—are probably more similar than not. PW: I do believe that, as a society, Canadians have a different view of the world than Americans. But within those larger groups, there are individuals who see things differently than their countrymen. I think Dan and I are among those, and so far, our perspectives are pretty close. Paul, in addition to your work as a photographer, you have also written an awarding-winning book, Where War Lives. Are you at work on any other book projects, and, if so, can you tell us something about them? PW: I'm currently collaborating with the legendary Magnum photographers on a book that chronicles sixty years of revolution. It's due out in the fall. Then I hope to move on to another book that's been barking at me as I try to keep up with other responsibilities. Have the two of you met? Dan’s poem in the current issue of the Malahat, “The Poet Takes Flight” suggests that you have, though that could merely be poetic license. If you have met, where? Did this meeting, or any subsequent one, further influence this collaboration? DO: In January 2010 I visited Paul in Ulukhaktok, in the Northwest Territories. It was our first meeting, and my first visit to the Arctic. The second act of my play does its best to dramatize this experience. And many of the poems are set in “Ulu” too. I gained an enormous amount from this trip, and I suspect it gave Paul more confidence and trust in what I was attempting. Meeting Paul has only deepened my respect for his work, and perhaps given me some new insights into this “Paul” character I still feel compelled to write about. I’ve been humbled, and inspired, by his trust, and I hope my writing has begun to return this trust in kind. PW: We have met, and it's always a pleasure. But I prefer to know artists like Dan through what they write. The inevitable small talk of human interaction detracts from my understanding of him as a truth-teller. So I prefer to meet on the page. Paul Watson's photography and Dan O'Brien's poetry both appear in our Summer 2012 issue (#179).